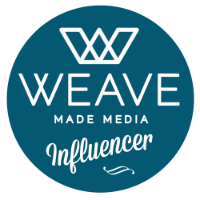 I am honored to be a World Market Ambassador and I thank them for sponsoring this post! and colorful chimichurri sauce, this is a dish you'll be making again and again! Growing up I had a pen pal, Tracy, who lived in Sydney, Australia. I can't remember how we first got connected, I think it was through some sort of teen magazine. I was around 12 at the time, and we wrote each other letters (can you believe it? Actual letters!) every couple of weeks. It was so awesome to learn about her life in another country. We sent each other pictures of our favorite places, and we also traded stickers. Do you remember doing that as a kid? Stickers were such a big deal back then! I had tons of them, and I think my mom still has some of them stashed away. 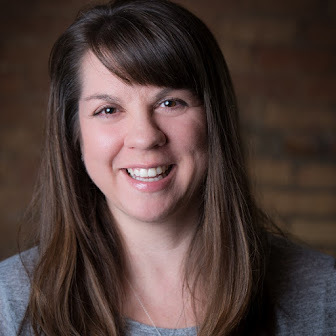 Anyway, it was my friend Tracy who initially sparked my interest in other countries, especially Australia, and it's someplace that I've always wanted to visit. I enjoy watching pro tennis and have really gotten into the Australian Open this year. As I've been watching, it has brought back all the memories of my friend Tracy from Sydney. I decided that in honor of her, I wanted to whip up an Australian inspired meal. Just a little something the kids and I could enjoy while watching the matches. You can watch the Australian Open on the Tennis Channel from now through January 29, 2017. For more details, check out the Tennis Channel! My love for seafood goes deep, and we all know that shrimp on the barbie is a big thing in Australia, so that my friends is what I decided to make. 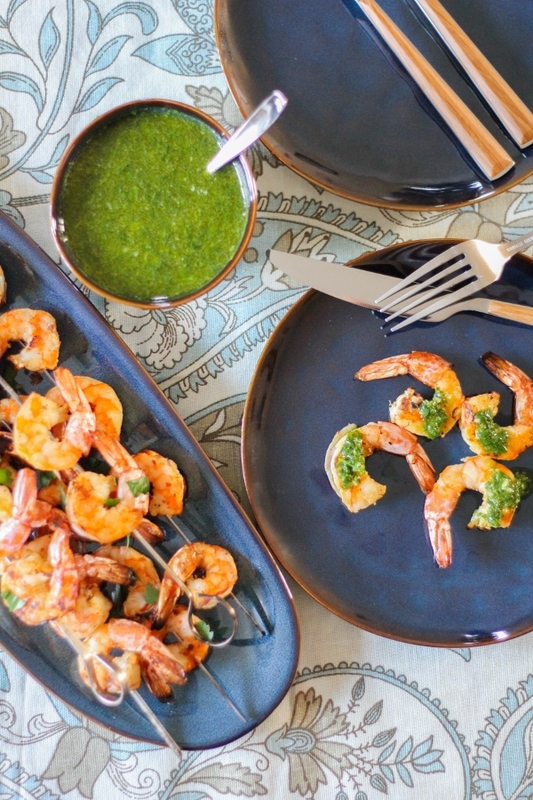 Shrimp on the Barbie with Chimichurri Sauce come together quickly and easily and they are so delicious and flavorful. I made a meal out of the shrimp by placing them atop a bed of white rice, but they make a great appetizer or first course too. Even though it's winter here, I still like to grill outside. (As long as my grill isn't buried in the snow!) Lucky for me, the winter has been pretty mild so far here in Michigan, so I've been able to grill quite a bit. If your grill is tucked away for the winter, don't fret. 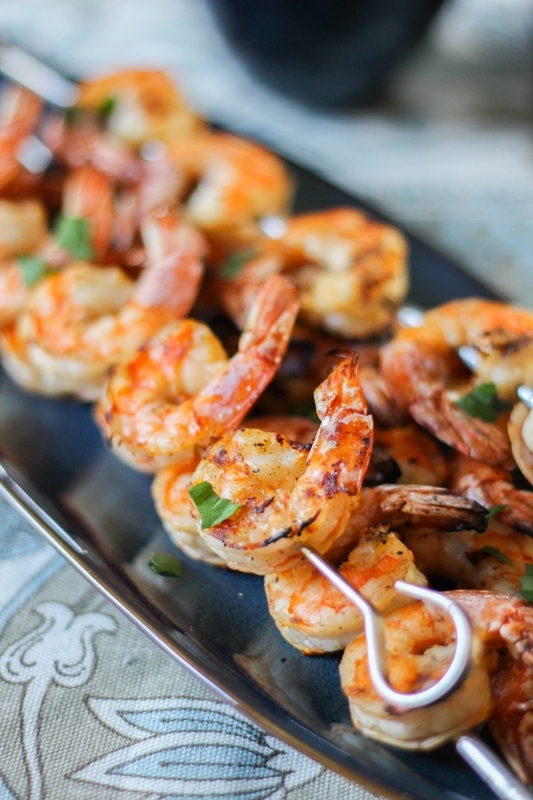 You can easily cook the shrimp on a grill pan on the stove. 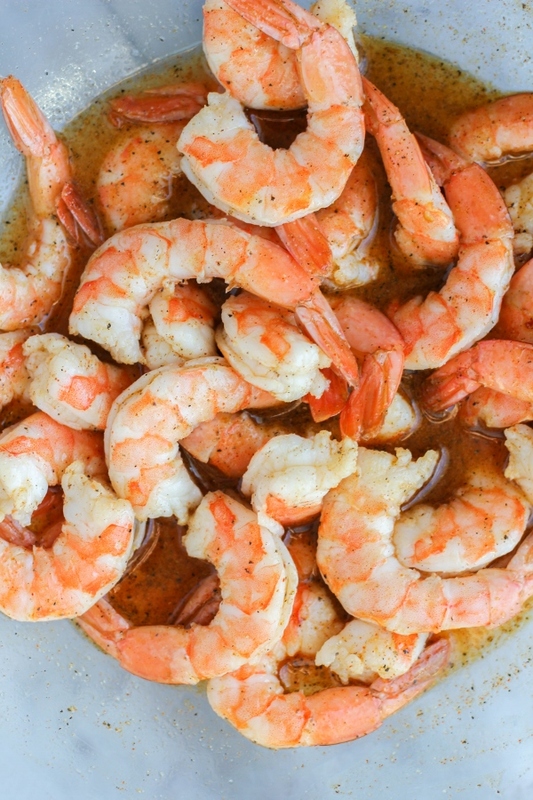 The marinade for the shrimp is amazing yet simple. 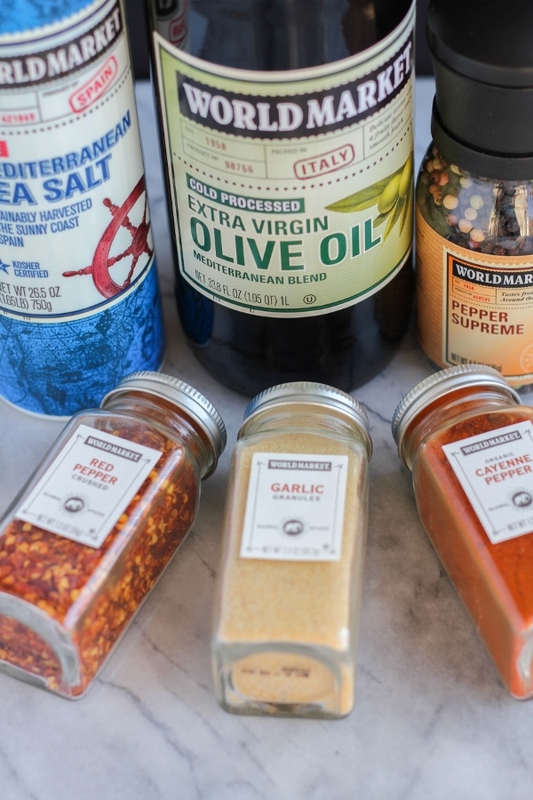 Just a handful or so of ingredients are all you need! Let the shrimp marinade for about 30 minutes or so and then they are ready to go on the grill. I love chimichurri sauce because there is no cooking involved and it's so light and fresh. You can whip it up the morning of, even the day before, you plan to eat it. 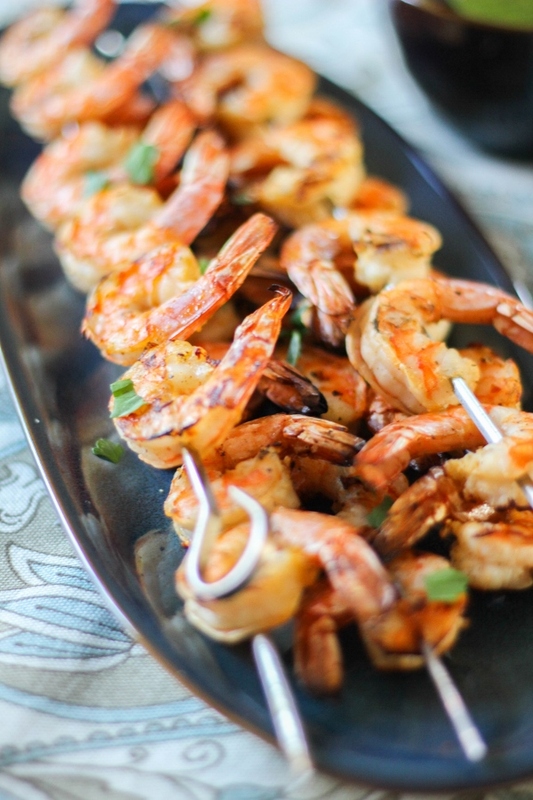 The longer it sits, the better it tastes, and it pairs perfectly with the grilled shrimp. To make the marinade, place everything from the olive oil through the crushed red pepper into a large bowl and whisk until well combined. Add the shrimp to the bowl and carefully stir so that the marinade coats all of the shrimp. Set aside for 30 minutes. Preheat the grill to medium-high heat. 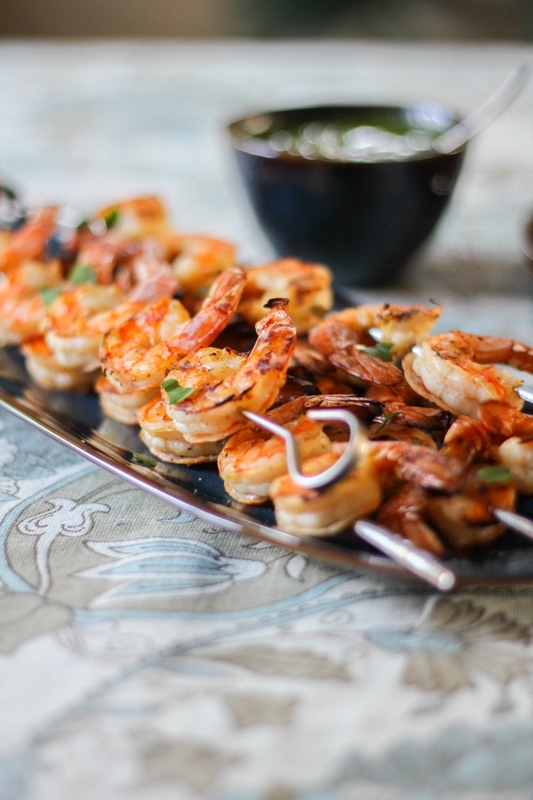 Add six shrimp to the skewers, making sure to pierce them at the tail and at the head. (This ensures that they won't spin when turning over or fall off!) Grill the shrimp until cooked through, about 4 minutes per side. 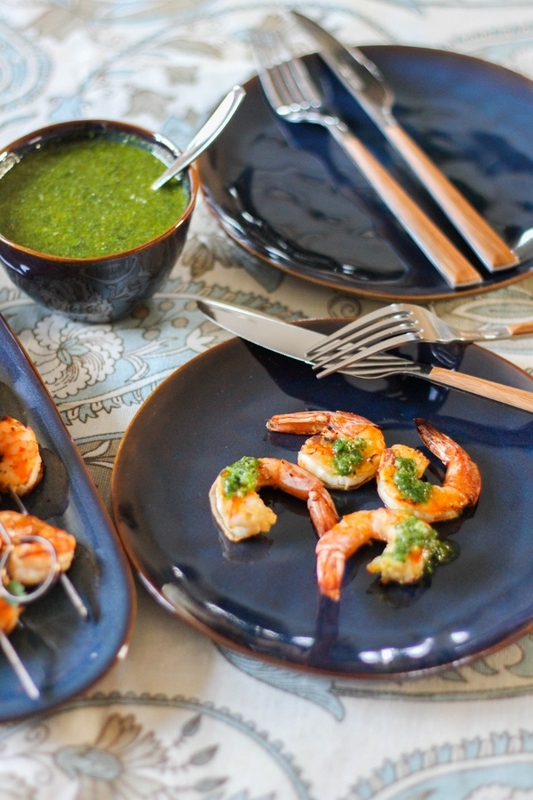 Sprinkle the shrimp with fresh chopped parsley and serve with the chimichurri sauce. 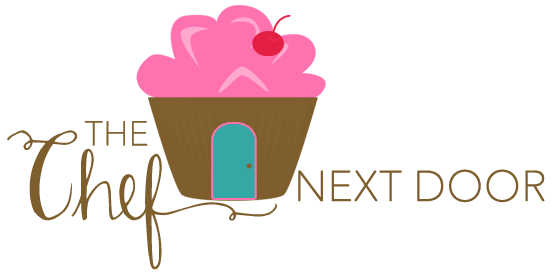 Shop this post! Be sure to head to your local Cost Plus World Market to get everything you need for this recipe, plus entertaining essentials and so much more! 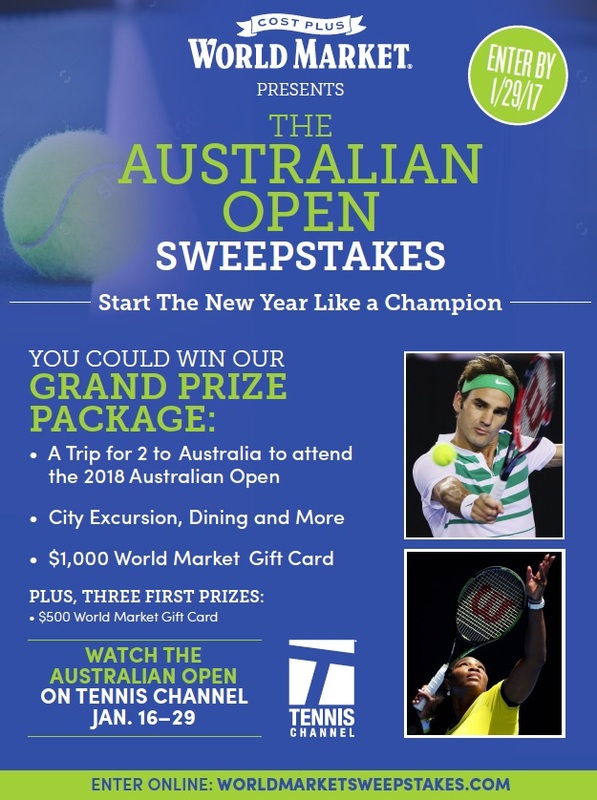 Wouldn't you love to be sitting in the stands at the 2018 Australian Open? Now's your chance to go! Cost Plus World Market is having an amazing contest right now, so be sure to enter to win here!